Tarantula on Trinidad - What's That Bug? What a gorgeous Tarantula you encountered. But for the lack on markings on the abdomen of your individual, we believe it resembles this Trinidad Chevron Tarantula, Psalmopoeus cambridgei, which is pictured on YouTube. Normally we refrain from citing Wikipedia, but it was there we learned the Trinidad Chevron Tarantula is “endemic to Trinidad” and “The female has chevron-shaped dark markings on the abdomen and her colour varies through shades of green and brown with characteristic red or orange flashes on the legs. The male is a more uniform grey or brown colour. 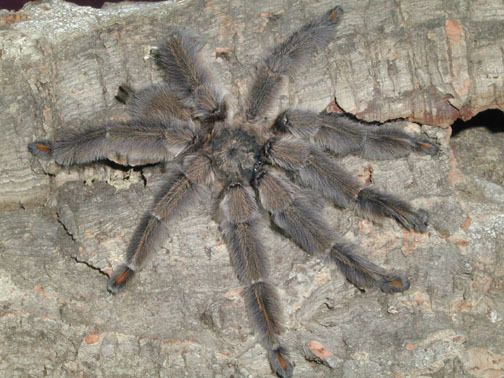 It is a large, hairy, fast growing species that reaches six inches in leg span.” The lack of markings and the longer legs indicates your individual is a male, and it sure looks like these male Trinidad Chevron Tarantulas pictured on Project Noah and Angelfire. According to Tarantulas of the World: “these animals spend most of their time up in trees blending in with their environment.” Because we are preparing for a trip away from the office for the holidays, we are postdating your submission to go live at the end of the month.